Then there are many other tools that become essential as needed, such as Surveys, Polls, Contests and others. Once a company has all of the basics in place (the sales funnel is working), then they look for ways to bring in more visitors. That's where we can help. 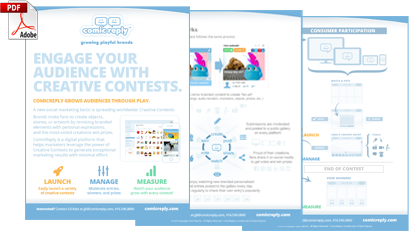 ComicReply is an advanced contest marketing platform. * Simple entry - trivia questions / caption for an image / answering a question / etc. ComicReply takes you beyond all of these by introducing a totally new dimension to the contest experience - enabling fans to create branded-personalized 'fan-art' as contest entries! That means your fans will finally be able to create their own stories using your branded content. 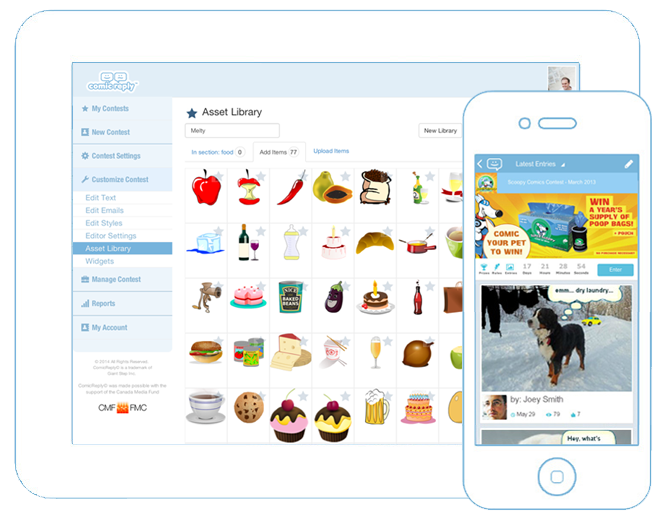 ComicReply is the first marketing platform that enables brands to upload their content assets and easily enable fans to create remixes by positioning elements, adding text, drawings, special effects, and other multimedia expressions to produce interesting contest entries. We support a large variety of creative entries (comics, drawing, audio-narration, object-making, character-making, and others). We call these 'Creative Contests'. Another industry term that was recently coined is 'Co-Creative Campaigns' (where the fans 'co-create' virtual items with the brand). Creative Contests are extremely effective marketing vehicles because fans love to play with branded content elements. Once they create an original entry, proud of their creation, they share them with friends to get votes (towards winning prizes). This 'Wow Factor' makes creative contests much more effective than regular contests. So far these types of advacned contests have been custom expensive projects made by agencies for brands. Our goal is to make these commonplace by offering a simple platform for launching a unique creative contest, managing it, and measuring the results. We want to make this affordable for SMEs.